Rs. 70,000 stolen from Miyyaru Mahlingeshwar Temple in Karkala. 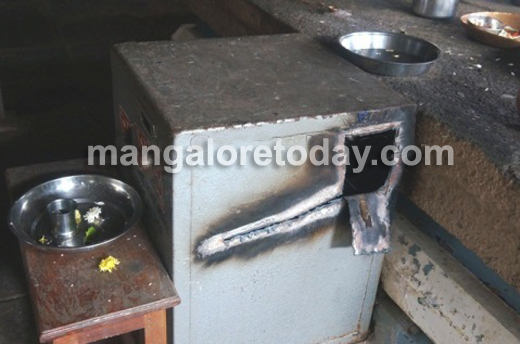 Karkala: July 8, 2015: Around Rs 70,000 was allegedly stolen by unidentified persons from Miyyaru Mahlingeshwar Temple in Karkala on wee hours of Tuesday. The thieves broke the door and the donation box with the help of gas cutter and escaped with Rs 70,000. The thieves only stole the donation box. The other boxes, bells and gold ornament were not stolen. The people suspected that the miscreant must be an insider. Irvatturu, Miyyaru, Mudaru, Renjala, Nalluru villages has single temple and is under government supervision. The donation box was to be opened by the temple autority next month amidst the theft happened. “There is a possibility that an insider has done the job” said locals. DYSP Vinay Naika, Circle inspector G M Naikar and SI Imran visited the spot and investigated.